– Take boiled potatoes and mix veggies in a big bowl and mash them together. – Add the spices, mix well and make 6-7 lemon-sized balls out of it. – Mix cornflour and water to make a medium-thick slurry. And take bread crumbs in a flat plate. – Roll each ball in cornflour slurry and then cover with breadcrumbs. – Heat oil in deep-frying pan and slide 2-3 koftas at a time carefully. Fry them on medium heat till golden brown. – Put them out on an absorbent paper and drain excess oil. – Heat oil in a pan and add ginger-garlic paste. Saute it for a while. – Add prepared brown paste with all spices and cook it uncovered for around 10 mins. – When oil starts to get released from the sides, turn off the heat and transfer it to a serving bowl. 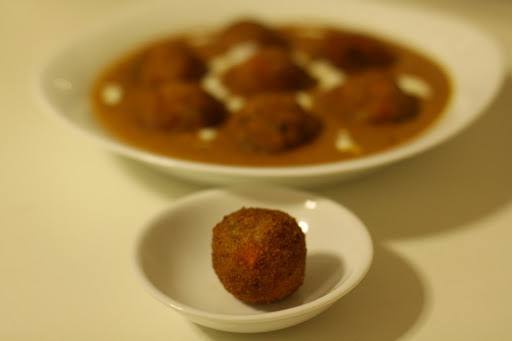 – Arrange koftas on the plate and garnish with fresh cream before serving!!! – You can pick any veggies of your choice: french beans (fansi), cauliflower, bottle-gourd (dudhi), cabbage, broccoli etc. 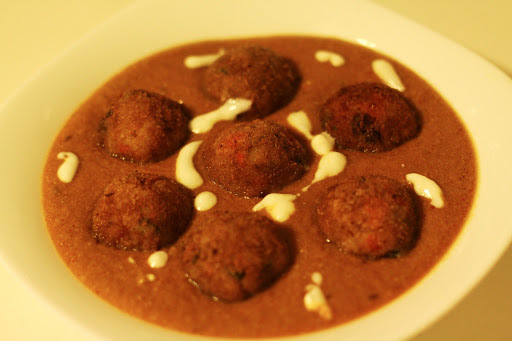 – A variation can be done using soaked soya granules with mashed potatoes to make protein-rich kofta! Hey Divya, Thanks for stopping by SJ's Food Court! :) Hope you enjoy the dishes here… Keep posting!